We believe that each child has a gift that is waiting to be unraveled and nurtured. Dancing is a fun activity for kids that exercise both body and mind. It helps with balance, flexibility, posture, creativity, and cultural understanding. It also bolster self-esteem. 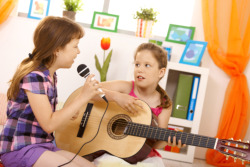 For those who are musically and dramatically inclined, we offer dancing programs that can help them develop their natural talents and early interest in the craft.